Rikishi Profile: Akebono – The First Foreign-Born Yokozuna. Akebono is perhaps best known for his gigantic size and for being the first foreign born sumotori to reach the rank of yokozuna. 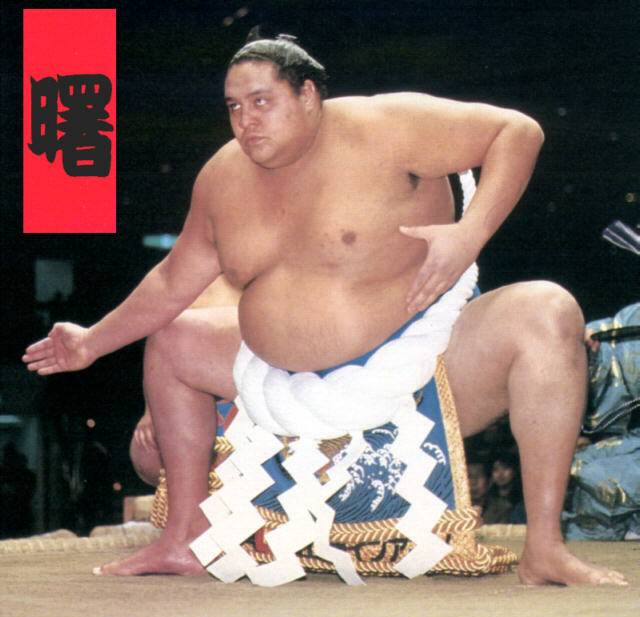 However, Akebono’s ground-breaking promotion to sumo’s highest position was only made possible by several other Hawaiian sumotori that came before him, who piece-by-piece, slowly managed to chip away at the insular nature of the sumo world and give it the more diverse, international representation that it has today. Takamiyama, the oyakata that invited Akebono to Japan, was the first foreign born rikishi to win an upper-division championship. Although an affable and very popular figure in Japan during the 1970’s, he was very careful to keep his head down and not cause any waves. I.e., he was good and managed to have an incredibly long career, but he wasn’t good enough to ever threaten making the highest ranks. He was, in a sense, the perfect foreign representative, as he proved that foreign born rikishi could indeed adapt to both the sumo world and the Japanese lifestyle as well. Konishiki, the next Hawaiian sumotori to follow him on the other hand, was not only vastly different in terms of temperament, he was also indeed good enough to actually threaten making the top ranks. Unlike Takamiyama, Konishiki had a brash and outspoken personality. His rapid rise, inelegant brute-force style, and gargantuan size (about 630lbs at his peak), left a bad impression in the eyes of some sumo purists. In 1992, after winning two out of the previous 3 tournaments and getting a 12-3 record in the other, some felt that he should’ve been promoted to yokozuna. He himself was quoted as saying that if he was Japanese he would’ve already been promoted—something he later denied saying and subsequently apologized for. The current thought that some in the sumo world had at the time, was that foreign born rikishi would never possess the appropriate grace and honorable qualities required by the lofty rank, with some Japanese sumo elders and newspaper articles openly stating that. Nevertheless, he was denied the promotion, and honestly in hindsight that looked like it was the correct call because his career soon went on a huge downswing after that. Still, the blunt and forceful way he burst onto the scene and made his large presence known, required the sumo world to take a harder look at the issue and helped further pave the way for Akebono’s later ascension. His long limbs, that were initially seen as a disadvantage, were now turned into an advantage as once he had a hold of you and got momentum going, he was like a runaway bulldozer and nigh impossible to stop. The savagery and aggressiveness of his attack often made it seem like he wasn’t just trying to beat his opponent, but literally obliterate their living presence from the dohyo as well. Fittingly, he arrived into sumo at the exact same time as two brothers and future yokozuna rivals: Takanohana Koji and Wakanohana Masaru (as well as the great ozeki Kaio). They were both the sons of an extremely popular rikishi from the 1970’s (Takanohana I), and were the nephews of another very popular yokozuna from the 1950’s, Wakanohana Kanji I. Akebono would consistently state that those two were responsible for his success, because from the time he arrived in Japan, he heard nothing but talk from the media and sumo world of how the two of them were going to dominate sumo for years to come. This helped give him the added motivation and determination to succeed and beat them. Before his very first match with Takanohana in the Jonokuchi division, his oyakata and stable mates simply told him to do as well as he could, as if his losing to him was a foregone conclusion already. He was then after promoted to yokozuna, and forever put to rest the issue on whether foreign-born rikishi could even do so, but as I wrote earlier, he was the last part of a link going back decades that led up to that breakthrough moment. Like Takamiyama, he kept his head down, and pretty much managed to stay out of trouble during his tenure in sumo. Although he was initially dominant and racked up 4 championships in his first seven bashos at yokozuna, he was later slowed down by a broken foot, back injuries, and increasing weight, and would soon be overtaken by Takanohana. In the next 5 years, he would only manage two more yusho championships, while Takanohana would win 16 during that same time period. (Wakanohana would also win 4, and Musashimaru would win 3 during that same time span). Takanohana did enjoy a huge advantage in having an extremely powerful stable (possibly the strongest ever in sumo history) with multiple rikishi he didn’t have to fight except in play-offs; including his brother: a fellow yokozuna, an ozeki Takanonami, and two former sekiwake’s: Takatoriki and Akinoshima, while Akebono had to go through all of them. Give credit where credit is due however. Whenever it came down to the final day to determine the championship during that period (which it often did), Takanohana nearly always defeated Akebono or Musashimaru to clutch out the championship. Takanohana did have that extreme will to win and added clutch factor, and he was the reigning dai-yokozuna of that era for a reason. Akebono’s rivalry with Takanohana and Wakanohana in the mid-late 90’s helped lead sumo to one of its “golden eras,” and among its highest levels in popularity and attendance. His breakthrough in reaching its highest rank helped paved the way to further internationalization (and subsequent dominance) of the sport by later foreign-born rikishi—like the future Mongolian greats—that were soon to come. Author sumothunderPosted on November 5, 2018 November 8, 2018 Categories Rikishi ProfileTags AkebonoLeave a comment on Rikishi Profile: Akebono – The First Foreign-Born Yokozuna.